It’s time to play the music, it’s time to light the lights, it’s time to meet the winners at The Redzone’s award night. 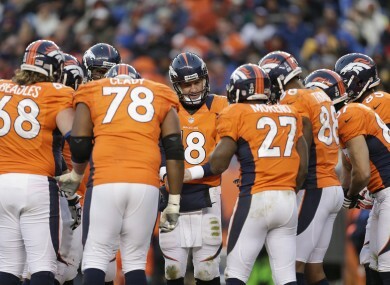 The Denver Broncos offense huddles around quarterback Peyton Manning. 2012 HAS BEEN a magical season in the NFL for a number of reasons. Records have tumbled, players have returned from devastating injuries to guide their team to the playoffs and I haven’t had to write a single column about a certain third string New York based quarterback. The race for MVP became a two-horse affair down the stretch while my offensive rookie of the year emerged from virtual obscurity to claim the prize from his more luminous colleagues. It was much easier to pick a defensive player of the year and coach of the year but my play of the year may raise a few eyebrows. Even if he had broken Eric Dickerson’s single season rushing record, Adrian Peterson would have just missed out on this award. Am I impressed with what All Day did this year? Without doubt; to come back from injury like he did and carry his team into the playoffs is extraordinary. However, there were real doubts as to whether Peyton Manning would ever play again. He didn’t take a single snap last year and his team traded him in for a younger model. But even rusty, damaged and with an entirely new offence to learn, Manning threw for 4,659 yards, 37 touchdowns and had the joint best completion percentage (68.6) in the NFL. On top of all that he led his team to a 13-3 record, the number one seed in the AFC and home advantage throughout the playoffs. How could MVP go to anyone else? All that said, I have to acknowledge what Adrian Peterson did this season. 2,097 yards is a phenomenal return from any running back, let alone one who blew his knee out this time last year. With the exception of Eric Dickerson and fans of the Minnesota Vikings, every single NFL fan wanted Blain Walsh to miss his game-winning kick last night so All Day could break the record. Sadly, he fell just nine yards short but he can content himself with postseason football and a real shot at winning the NFC championship, despite the absence of any real passing game to help him out. 81 tackles, 20.5 sacks, 16 passes defended and four forced fumbles. All this from a 3-4 defensive lineman. JJ Watt has been a defensive machine this season and has single-handedly filled the gap left by four Texans players (two to free-agency, two to injury). He finished the season ranked 10th in passes defended which is all the more amazing considering every other player in the top 35 is a defensive back. RGIII will be the popular choice. Andrew Luck may well win the NFL’s own award. For me though, Russell Wilson was a third round pick who won the starting quarterback job in training camp and went on to equal Peyton Manning’s rookie record of 26 touchdowns while taking his team to the postseason. Incredible considering there were those who felt his height would mean he wasn’t a viable NFL quarterback. There may still be some questions over his character, part of the reason he fell to the second round in April’s draft, but there’s no doubt about Janoris Jenkin’s on-field ability. 73 tackles, four interceptions, three of which he returned for touchdowns, as well as a fumble recovery for a touchdown, give the Rams corner back the edge over Lavonte David of the Buccs. When Chuck Pagano was diagnosed with acute promyelocytic leukaemia in September, many thought to Colts would struggle. However, under Bruce Arians, Indianapolis posted an 11-5 record with a rookie quarterback, a postseason berth and Arians can surely expect a call from another NFL team in the New Year. Afterall, there’ll be plenty of positions available. This one play alone was enough to move the NFL to end its dispute with the regular officiating crews and rid us once and for all of their terrible replacements. Not sure Packers fans will take much solace from that mind. Email “The Redzone: Here's our end-of-season NFL awards ”. Feedback on “The Redzone: Here's our end-of-season NFL awards ”.